Sanctions imposed by other Arab states are continuing to push up food prices in Qatar while hurting the real estate market, according to inflation figures released by the government on Tuesday. The annual inflation rate fell back sharply to 0.2 per cent in July. 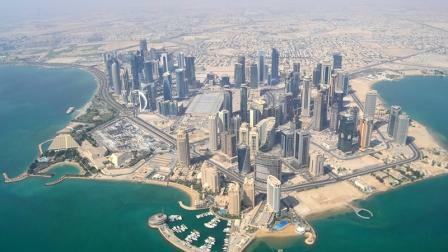 It had spiked to 0.8 per cent in June from 0.1 per cent in May after Saudi Arabia, the United Arab Emirates, Bahrain and Egypt cut diplomatic and transport ties with Qatar on June 5, accusing it of supporting terrorism, which Doha denies. By closing Qatar's land border with Saudi Arabia and disrupting maritime shipping routes, the sanctions slashed Qatari imports by more than a third in June, pushed up prices of some basic goods and hurt business sentiment in Doha. There were fresh signs of that damage in the July inflation numbers. Food and beverage prices climbed 4.5 per cent from a year earlier, their fastest rate of increase since at least 2014, and accelerating from a rise of 2.4 per cent in June. Food and beverage prices gained 4.2 per cent from the previous month. Many dairy products and other perishable foods used to be imported across the Saudi border; they are now having to be flown or shipped in across longer distances. Prices of non-perishable goods such as clothing, shoes, furniture and household appliances fell in July, suggesting Qatar is having no trouble importing those products at affordable prices. But housing and utility prices sank 3.6 per cent from a year ago in July, their biggest drop for at least several years, and slipped 0.6 per cent from the previous month. They began falling early this year and dropped 2.9 per cent from a year ago in June. Saudi, UAE and Bahraini banks have begun pulling deposits and loans from Qatar, tightening liquidity in the banking sector, while there is anecdotal evidence of citizens from the three countries offering real estate investments for sale, bad news for Qatar's property market. Official figures for building permits issued in the two-month period of June and July do not show a change in trend, but there is a lag between applications for permits and approvals, so the impact of the sanctions may be felt later. Some builders which have received permits could choose to delay executing projects.